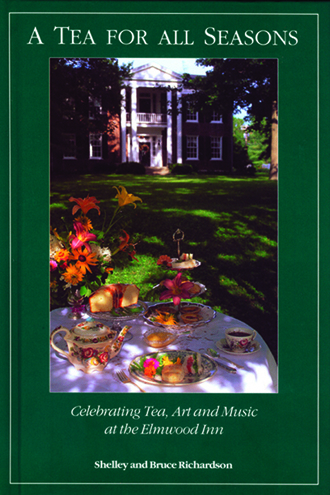 The second installment in the three-volume set of afternoon tea recipe books by Shelley Richardson. 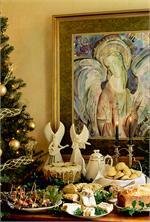 Filled with inspiring art, music, and seasonal themes. Now in it's 5th edition! 12 themed teas: Angelic Tea, Fireside Tea, Tea for Lovers, Irish Tea, Tea with Shakespeare, May Day Tea, Tea in the Rose Garden, 1850's Summer Tea, Sunflower Tea, Tea at the Ballet, Kentucky Harvest Tea, and Tea with Monet. 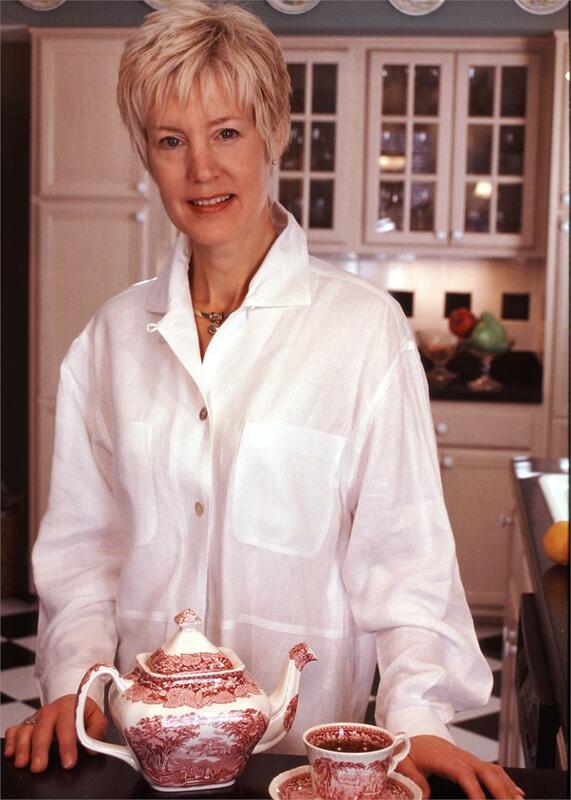 "This is one of the most important cookbooks on tea that has been published. 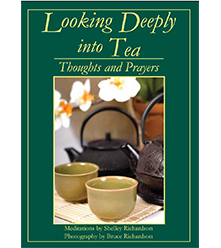 It will position anyone to give a great tea party and is must reading for any tea enthusiast. Very well written with top-flight photography!" Cute book. Mostly a cook book though so if you are looking for that you will love it. I was hoping for a little more on the teas and their history but it did not offer this. 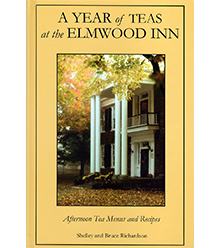 A Wonderful Guide & Celebration of Tea at the Elmwood Inn! Whether you're a tea connoisseur or just beginning to explore the wonderful world of tea, "A Tea For All Season's" is an excellent companion to have. 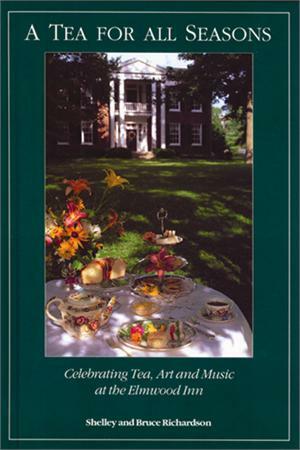 Written by Bruce & Shelly Richardson, owners of the Elmwood Inn in Perryville, KY, they provide an informative, enjoyable guide to preparing and hosting a perfect tea, as they do at Kentucky's premeir tea room. Breaking the book down into seasonal & monthly themes, they provide recommendations of food, tea and music to accompany your celebration. 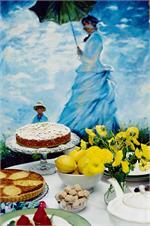 The tea themes include angels, roses, sunflowers, Shakespeare, Monet, the Ballet, Kentucky Harvest, etc. 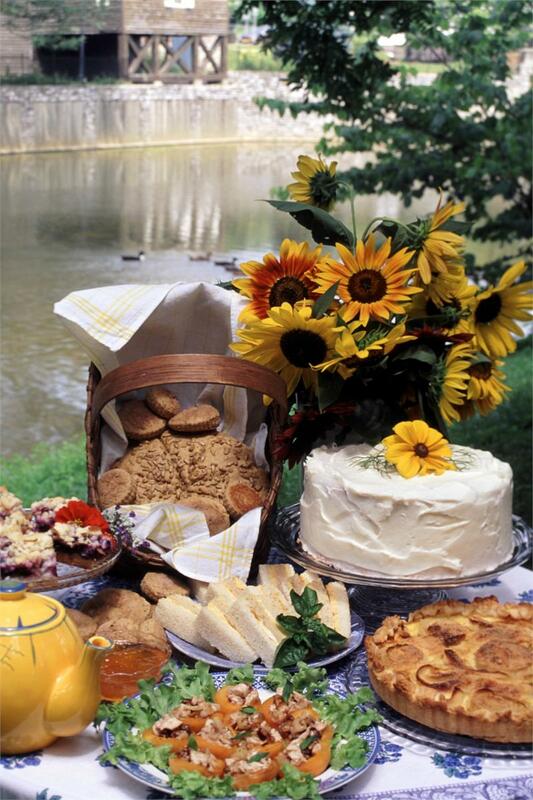 The meal recipes are also included and some of them are largely synonymous with Kentucky's culture. They give an overview of each theme and share the historical significance of all involved. The Elmwood Inn, itself, has a rich history and is listed on the National Register for Historical Places and is designated as a Kentucky Landmark. It's probably better known for the role it played during the Civil War battle, that befell Perryville on October 8, 1862. The book is also filled with wonderful colored photograph's, including some lovely peices of artwork, which can be found hanging on the walls of the Inn throughout the year (featuring notably local artists). The art, too, is coordinated with the theme of each month's menu. The Richardson's create a warm rapport as they entice and educate the reader; Much like their genteel hospitality when greeting in person. 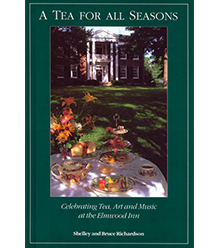 At the end of the book you'll find a list of tea suppliers and featured artists, including Elmwood Inn. 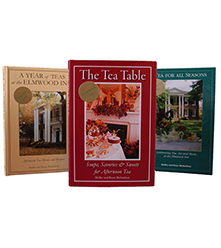 "A Tea For All Season's" would make a great gift for any tea lover, and is a must to add to your tea repertoire. At the least, this book will leave you with the desire for a delicious pot of steaming hot tea. Most likely, it will inspire you to plan a tea party of your own. 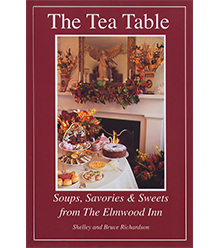 The Richardson's have also written two other books, "A Year of Teas at the Elmwood Inn," and "The Great Tea Rooms of Britain." The cover of this book is a pleasant green with a picture of the Elmwood Inn. I hope they will submit a picture as it is quite a beautiful cover. The recipes are organized according to Winter, Spring, Summer and Fall. Within each season, you will find three teas for that season. In December an Angelic Tea, Fireside Tea or Tea for Lovers will warm your home. In the Spring, enjoy Irish Tea, Tea with Shakespeare or May Day Tea. 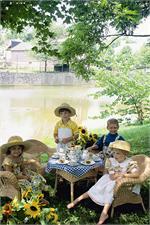 When Summer arrives, Tea in the Rose Garden, 1850's Summer Tea or Sunflower Tea sounds very appropriate. In the fall, Tea at the Ballet, Kentucky Harvest Tea and tea with Monet include recipes for Pavlova, Cream puff swans and Pear Tart. Music selections are also recommended, The Four Seasons being one of my favorites. Drawing on an eclectic mix of culinary traditions, the tea menu for each season is based on a central idea and seasonal fruits and vegetables are used to their best advantage. 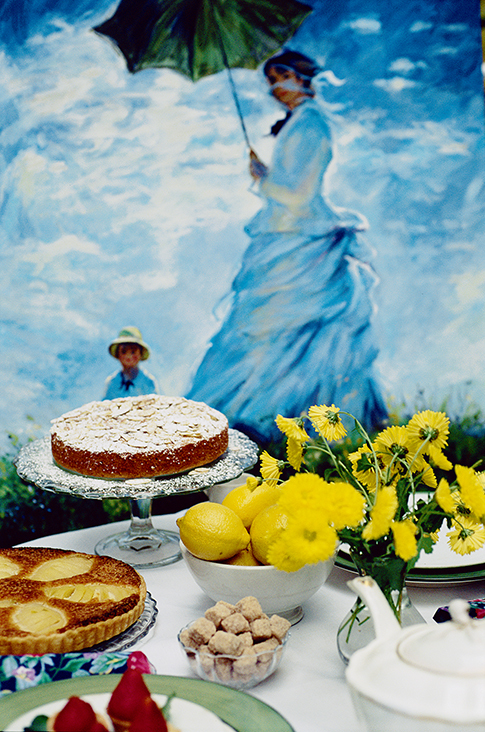 Art is also exhibited in the tea room making each season an occasion for celebrating art. A picture of a painting sets the mood for the each season. The authors have a great love for the arts and tea and to them life is art. In each area of their lives, they try to be artists, even when preparing a pot of tea. If you enjoy sipping tea in a serene setting surrounded by beautiful art, fresh flowers, delightful foods and great music, you will relate well to this cookbook. If you want to create this peaceful setting, your will find many ideas to inspire you. Each recipes has a fun-to-read header and sets a mood for your own cooking adventure. When you drink a cup of tea, you may find yourself thinking about everything that is right with the world and find tea time a way to escape from the everyday world. If you are ever in Perryville, Kentucky, the Elmwood Inn serves tea with such flair and reservations are advised. It is one of the state's best-known landmarks. This book, the second from Bruce & Shelly Richardson, owners of Kentucky's Elmwood Inn, offers much more than menus and recipes. It offers suggestions on how to plan a tea that mirrors the season and pleases all the senses. The book focuses primarily on menus and recipes, but also recommends specific teas and musical selections to accompany the dining experience. A feast for the eyes as well, the photographs profile not only the food, but the works of contemporary artists. The resource guide at the end of the book offers addresses at which the reader can buy tea, purchase music, or contact the artists whose works appear throughout the pages. 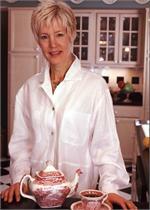 If you're expecting difficult recipes using gourmet ingredients, you will be disappointed. The recipes are simple, well-written, and utilize ingredients anyone can find at their well-stocked local grocery. Having read this book and its predecessor (A Year of Teas at Elmwood Inn), I am now looking forward to visiting the Inn later this summer and sampling these delicacies for myself. I highly recommend this book for anyone who loves tea, loves to cook, or simply enjoys the pleasure of a well-written and informative cookbook!